Blue icing and blue fondant wedding cakes of various different tiers some round and some square, covered in sea shells for that ultimate beachy, marine style wedding. 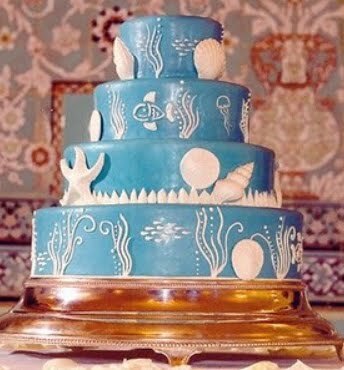 If you are looking to be inspired to create your own original blue sea shell wedding cake then you have come to the right place! 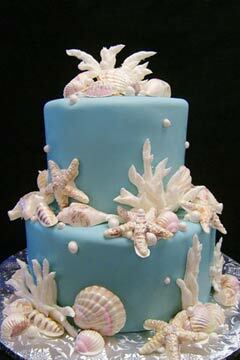 Below are 15 wedding cakes pictures to inspire you! 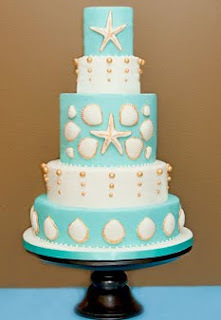 Bright celestial blue round four tier wedding cake with white seashells and starfish. Pretty four tier light blue wedding cake with plenty of white coral and sea shells adorning this soft and delicate beach themes wedding cake. Light blue wedding cake with three round tiers and decorated with lovely sea shells. Two tier round wedding cake in bright light blue with blue seashells and dolphins. 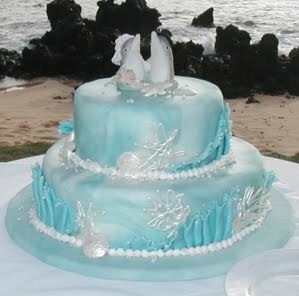 Two tier marbalised blue wedding cake with dolphin bride and groom topper. Delicate lilac blue wedding cake with pure white sugar sea shells. Light blue three tier round wedding cake in light blue with nautical theme in white and gold. 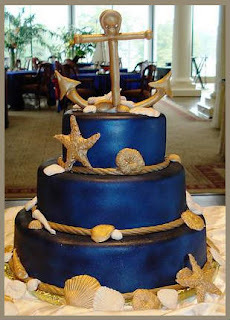 Gorgeous metallic dark blue wedding cake with nautical theme. 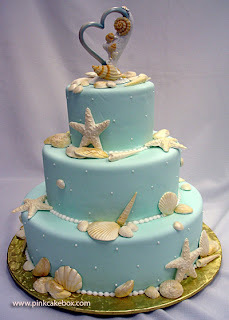 A golden rope separates the tiers and golden sea shells are delicately place around the cake. The cake is topped off with a big golden anchor cake topper! 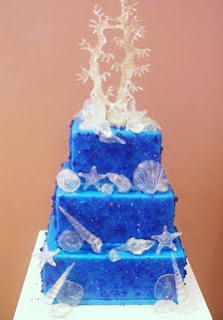 Bright blue three tier square wedding cake with clear and white sugar seashells and coral. 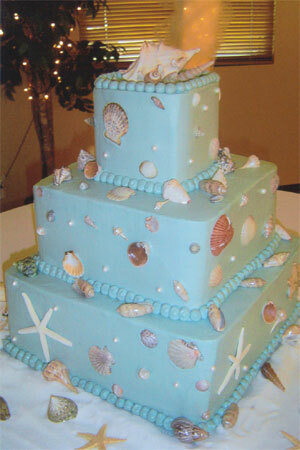 Large three tier square wedding cake in light blue with seashells. 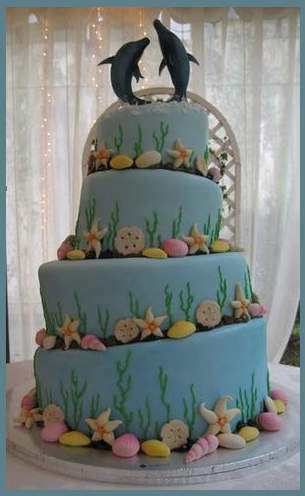 Stunning round four tier light blue wedding cake shaped to look as though one is looking at it underwater. 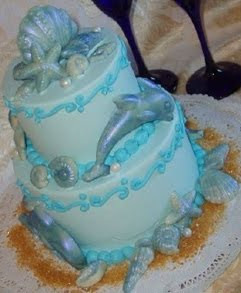 With plenty of sea shell and dolphin cake topper. Metallic light blue beach wedding cake with white seashells and light blue satin ribbon separating the three round tiers. Two tier tiffany blue wedding cake adorned with white sea shells. 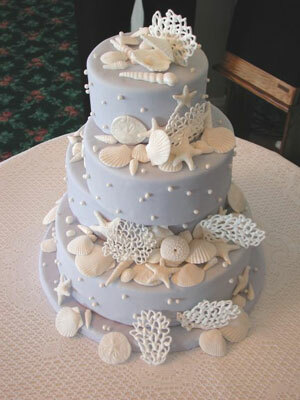 Three tier pale blue wedding cake with plenty of sea shell decorations, perfect for that wedding at the beach! 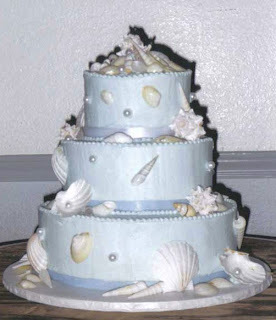 Five tier sea shell cake wedding cake in aqua blue, white and gold. 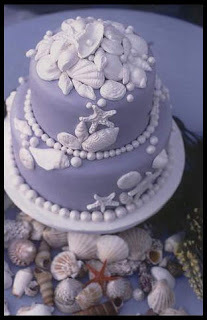 With edible seashells and pearls. 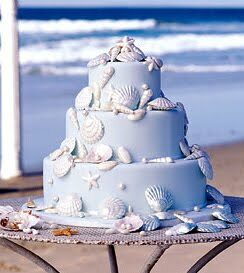 Loved the "Three tier pale blue wedding cake with plenty of sea shell decorations"
It is truly perfect for weddings at the beach!